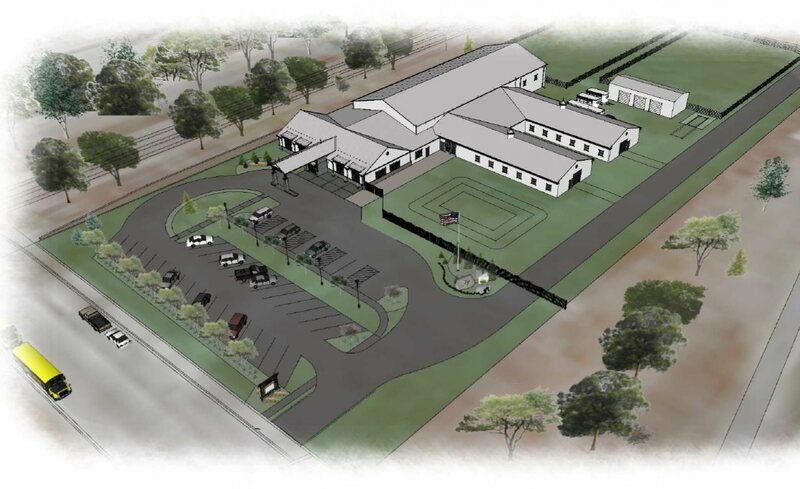 Rendering of Milwaukee Urban Stables. 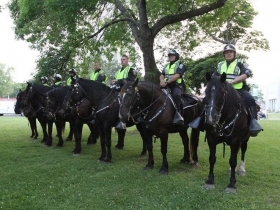 The Milwaukee Police Department‘s horse-mounted patrol would receive a new home at 143 E. Lincoln Ave. under a proposal by single-purpose non-profit MCEC Development. 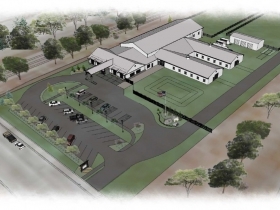 The organization will also develop an equine therapy center in the proposed 27,191-square-foot building. 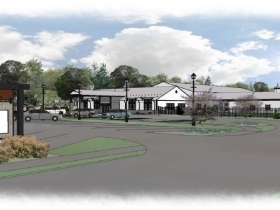 Richard Lincoln, a retired Mandel Group executive who is serving as the owner’s representative for MCEC, told the city’s Zoning, Neighborhoods & Development Committee that the union of police horses and a therapy center is a first-of-its-kind partnership. According to Lincoln, the equine therapy will be targeted at veterans suffering from post-traumatic stress disorder and children with autism. The facility, to be located in the city’s Bay View neighborhood, will be known as Milwaukee Urban Stables. 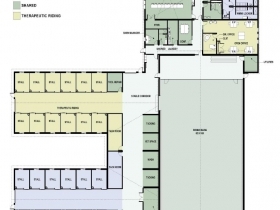 The facility will include 24-stalls, two outdoor riding areas, and a small community room. The facility is designed to accommodate large groups of students taking field trips to it. 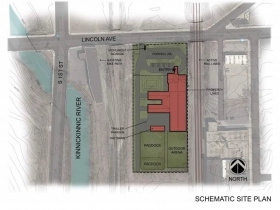 The project, to be developed on a vacant site, has an estimated cost of $5.65 million. MCEC is receiving $1.5 million in financing from Forward Community Investments and has been fundraising over the past few years to raise the remaining $4,100,000. Lincoln said the group now has more than $5 million for the development. The multi-step transaction includes the city selling four acres of heavily encumbered land for $1, the non-profit building the $5.65 million complex and the Milwaukee Police Department entering into a 30-year, $100,000 annual lease. The city previously leased horses from a private operator located on E. National Ave., before buying the horses outright in recent years and leasing space at the cost of $5,000/month in Racine County. Rowe said when factoring in travel costs, the cost ended up at approximately $100,000 annually. Rowe told the committee that the lease in Racine County expired, so the police horses are back on E. National Ave. temporarily for $1/month plus the cost of building improvements. The E. National Ave. site is not seen as a permanent option because of the condition and size of the facility. The property for the new horse barn, originally used by a glass bottle manufacturer, was acquired by the city in 1981 through property tax foreclosure. 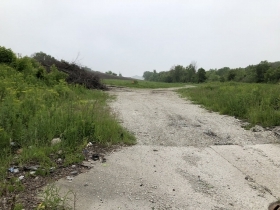 It’s bordered to the east by heavily-used Canadian Pacific railroad tracks and to the west by the southern leg of the Kinnickinnic River Trail. The southern portion of the site was sold to Klement’s Sausage Co., which has a facility stretching all the way to S. Chase Ave. A number of sewer and access easements run through the site, making substantial building development very difficult. To deal with environmental issues caused by its past use, the Environmental Protection Agency awarded a $200,000 cleanup grant to help address soil and groundwater contamination. Should the City Own the Complex? Alderman Robert Bauman isn’t pleased with the structure of the deal. “I like them. Downtown likes them. Everyone likes the horse patrol, but why are we involving the middle man? I don’t get that,” he said at Tuesday’s meeting of the Zoning, Neighborhoods & Development Committee. Bauman expressed concern that the city is signing itself up for a 30-year commitment, even if the mounted patrol is eliminated. Assistant City Attorney Jeremy McKenzie told the committee that a “tweak” to the lease is being prepared that would make the lease subject annually to the city allocating funds towards it. “To me that’s not a tweak, that’s a fundamental change,” said Bauman. He moved to hold the matter until the terms were finalized. “Clearly leasing is better if we can back out after a year. That’s a slam dunk,” he quipped. The committee voted unanimously hold the matter pending a special meeting scheduled before the Common Council meeting on July 31st. Very nice! It’s a long way from downtown and the lakefront, so I assume they will still be transported? A lot better though. Are there still horse and buggies for joy rides downtown? If so, where do those horses stay, at the old barn? Otherwise, what will become of that property? The article mentions that the EPA awarded the site a 200k cleanup grant, but which group would take over the remediation work? Or has the cleanup already been completed at that site?